The stochastic oscillator gives a false overbought or oversold reading at a new highest high or lowest low because the highest high or lowest low is then used in both the numerator and denominator of the ratio. Therefore, the stochastic oscillator works best in a sideways price movement. So far, you just have one line in the indicator. What you really want is some kind of crossover guideline to tell you whether to buy or sell, so you don’t have to guess by eye. In the stochastic oscillator, the crossover line is named %D and is formed by a short-term simple moving average of %K. A moving average always smoothes and slows down the price series, so %D is sometimes called the smoothed indicator as well as the “slow” indicator. When you put the two indicator lines together, you get crossovers of the first indicator line by the smoothed shorter-term indicator line that give you exact buy/sell signals. When %K crosses above %D, it’s a buy signal, and the other way around for a sell signal. And as with any indicator, you can change the number of days in the lookback period. You can sometimes see patterns on a chart of the stochastic oscillator that are meaningful. For example, this figure shows some of the nuances of the stochastic oscillator. Here, the stochastic oscillator shows a series of three higher highs in the indicator that have %D rising over %K in “right” crossovers (to the right-hand side of the peak), implying hidden power is in the up move on the left-hand side of the chart that cannot be discerned from just looking at the prices themselves. But look again. 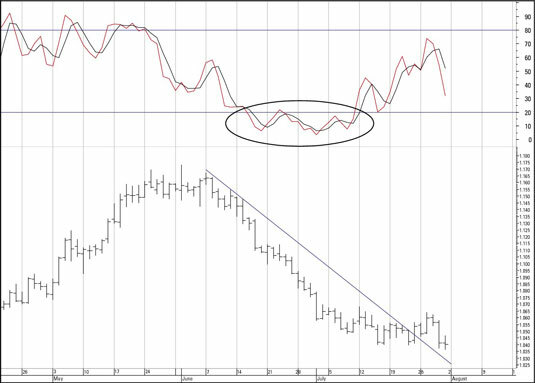 Under the first bump up in the stochastic, only two days have lower closes (and one duplicate close). You could also draw a support line under the lower closes. As it happens, this time, the final downside crossover beats the break of the support line by five days, but that’s not always the case. 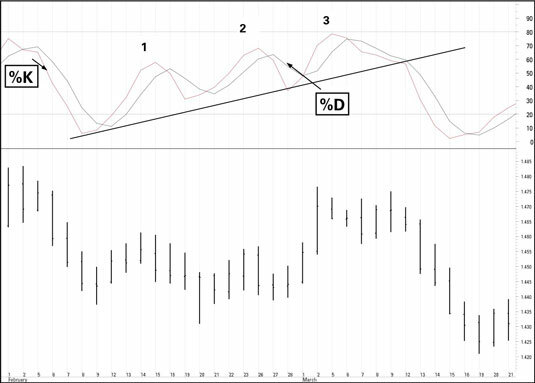 Don’t use the stochastic oscillator in a strongly trending market. When your security exhibits an abnormally long period of trendedness, you can get jumpy wondering how long it will last. However, this type of situation is when the stochastic oscillator isn’t useful and can be downright dangerous. In this figure, the stochastic oscillator rises up from the oversold level in the oval and a little later, the price rises over the hand-drawn resistance line. Surely this is a buy signal! But the price turns around after only a few days and puts in a lower low. If you’re a very short-term trader, you may have been able to eke out a small gain from the buy signal, but not from this instance of the stochastic oscillator alone.